Did you know that February, traditionally, is the month by which most people have given up their resolutions? And no wonder! We set goals without action plans and often that leaves us disappointed and we set aside our resolutions since life gets in the way. 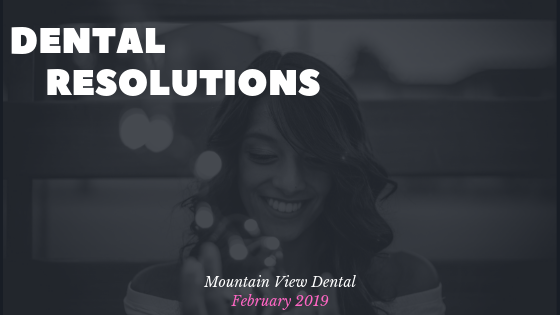 A popular goal that we hear about in the dental office is “improved dental health.” Sometimes that means scheduling your cleaning and exam every 6 months or perhaps that is investing in Invisalign to straighten your teeth and giving you more confidence in your smile. Whatever YOUR dental goals are, we want to work WITH you to achieve them. If you’ve given up your dental resolutions by now, don’t worry. There is time to pick it back up and work toward your goal of improved dental health, straighter smile, whiter teeth, etc. As for working on your dental health (and overall health as a result), here are some things you can do to help! Drink more water– The USDA recommends adults drink at least 2.7 liters of water a day! While this helps your body with digestion and flushing toxins, it also strengthens your teeth and keeps your mouth clean. This is especially true with fluorinated water which is known as natural cavity fighter. Stop Smoking– We all know the health benefits for your body when you quit smoking. Smoking also causes tooth discoloration, delayed healing time in the mouth, increased risk of cancer and bad breath just to name a few. Eat Healthier– Eating more fruits and vegetables helps keep your teeth clean. When you eat whole foods with less sugar, there is less for the harmful bacteria to eat and cause tooth decay. A nutritious diet also helps keep your teeth healthy and builds your immune system to help prevent disease. Brush 2 times a day– This one is easy to do but sometimes people forget. The best times are in the morning and before bed, but sometimes a midday brush does your teeth well, too! Power brushes are a WONDERFUL option and have built in timers to tell you when to switch sides of your mouth and when your 2 minutes is up. Flossing– This is another easy addition to your daily routine! Just a few minutes at the end of the day to clean the parts of your teeth that can’t be reached with a brush! This clears out any residual food and will help fight bad breath. Don’t like floss? Try a Waterpik! Whatever you choose, you just want to make sure you’re cleaning between your teeth. Smile More! – This might be the easiest goal you have ever set for yourself! When you smile, your body releases chemicals that help you fight stress, lower blood pressure, and feel relaxed. Smiling also brightens the mood of those around you and can really make a difference in someone’s day. If that’s not enough, one last benefit is that you get to show off the amazing teeth you are getting in shape all year long! 2019 is THE year to get your mouth in shape. We will work with you to achieve your goals. Just give us a call and mark that off your list of to-do’s!